“On December 19, 2017, I went in at 39 weeks pregnant to have our third child. We currently had 2 boys and had a seamless pregnancy with our upcoming daughter who was going to be our Christmas baby. I was excited to be home in time for the holidays as a new family of 5. The C-section went great, the doctor delivered with no problems, and Elliana Faith (“Ellie”) came out quickly and with no issues, or so we thought. My husband Kevin held Ellie for a minute, but I was unfortunately too out of it with extra sedation medicines that I did not get to hold her before, all of a sudden, they whisked her away to the NICU. When my meds finally wore off and I was coherent again, the doctor told me I would get to see and hold Ellie within an hour or two — that she just had some fluid on her lungs which was very common after a C-section, and she simply needed a little extra oxygen and would be fine. Well, oxygen is actually not what Ellie needed. Fast forward 7 weeks. 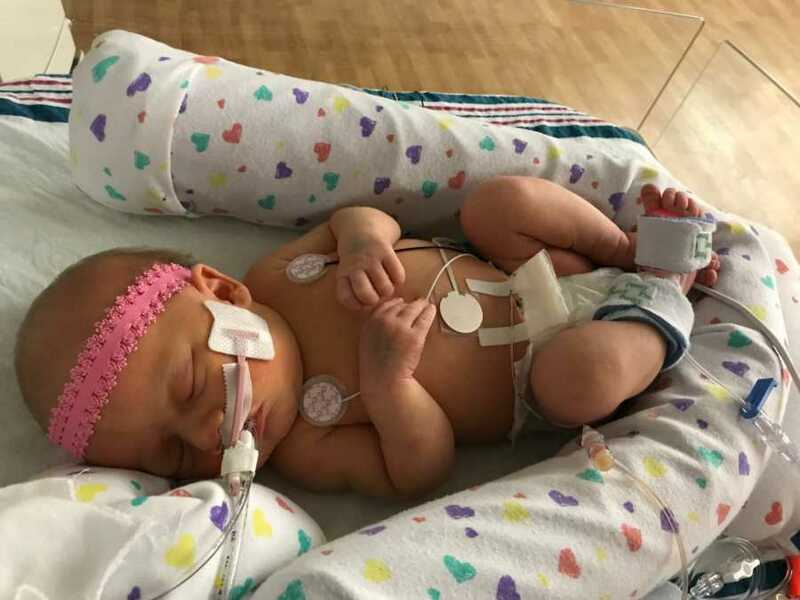 By this point, we had spent Christmas and New Year’s in the NICU, our daughter had remained lethargic, and her breathing was extremely shallow. 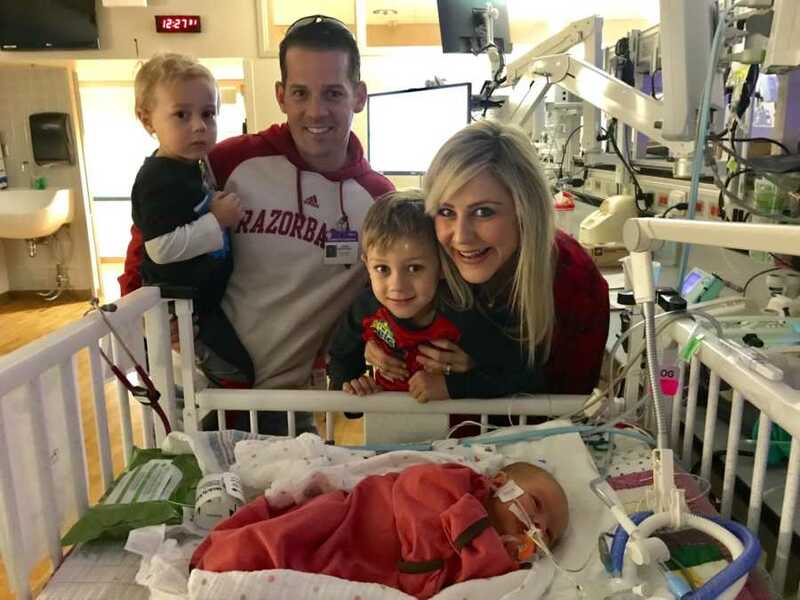 When Ellie arrived by ambulance at Arkansas Children’s the evening of her birth, her CO2’s were so off the charts that she immediately got intubated. Honestly it is a miracle she did not die or at the least have brain damage on the way to Children’s because it became known to us after weeks and weeks of testing that Ellie would have an extremely rare genetic disorder called Congenital Central Hypoventilation Syndrome (CCHS), which is a neurological disconnect where the brain does not communicate to the body to sufficiently breathe, especially while sleeping. There are only 1,200 known cases of CCHS in the entire world. We were told by doctors that CCHS is a cousin to SIDS, Sudden Infant Death Syndrome. Basically, Ellie quits breathing when she sleeps, and even while awake, sometimes her CO2 levels get very high. Based on what Ellie is doing, she breathes in oxygen just fine but doesn’t blow out the carbon dioxide. There are many different variants of CCHS, and every case is different. Thankfully, Ellie’s case is on the mild side, however, we knew getting this diagnosis would be life-altering. 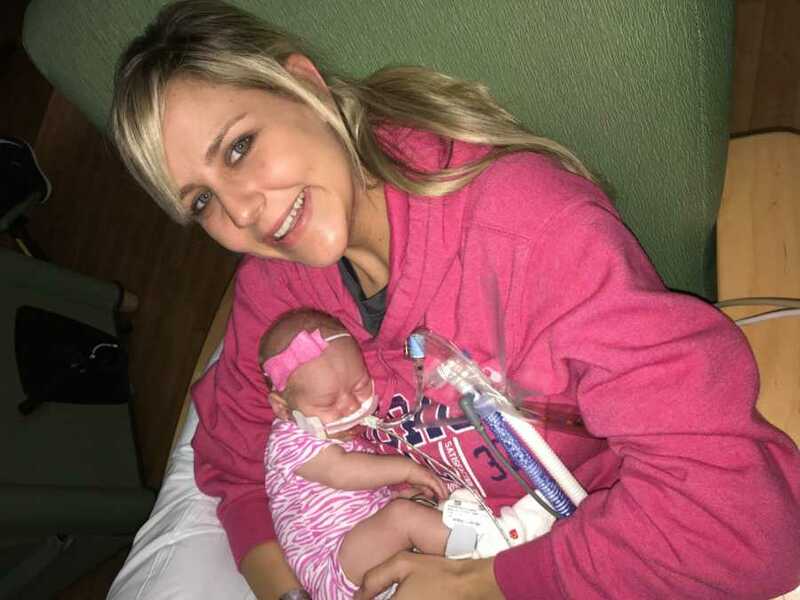 We were so hoping and praying that she simply needed some more time to breathe better on her own — that perhaps her lungs simply needed a little more time to develop, that maybe the meds from my sedation had gotten into her system and were affecting her longer than normal, or something. Our sweet Ellie, who breathed just fine in my womb and kicked and moved around like a Karate kid, was now being told that something was extremely wrong, and if this genetic testing came back positive, we would be faced with a life change we were totally not expecting. On January 23, 2018, exactly 5 weeks after Ellie’s birth, we got the final word that Ellie had CCHS. We were sad and overwhelmed, but at the same time, we were glad the diagnosis was not worse. 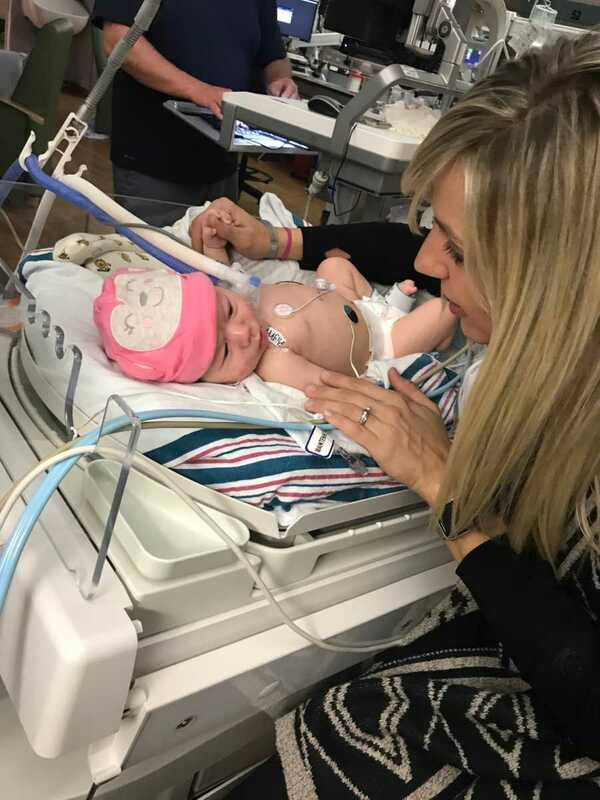 At one point we were told Ellie might have any number of syndromes that could have been so severe that we would have watched our child deteriorate and die in the hospital. And deep-down in my heart, I had a feeling there was going to be something different about this child, although I didn’t know what. My husband always does such a great job at taking life in strides, not focusing on the negative, and always reminding me how good we have it compared to others, no matter what we are going through — and even this awful news was no exception. I always thought of those reminders during the rollercoaster of this time. On the other hand, I did not exactly know what dealing with a CCHS child would entail, and nothing could ever entirely prepare a momma’s heart for the shock of the news that: “your daughter is going to need a tracheostomy and a ventilator–she will not be able to breathe on her own without the support of a vent.” So another 2 weeks later, on February 6, Ellie went in for her tracheostomy surgery. I thought this was going to be one of the hardest days to experience. And while this day was painful in one sense, on the other hand, this was one of the most beautiful days I had yet experienced because I got to see my daughter’s whole face for the first time. You see, her face had been covered with all the tubing from the intubation and feeding and breathing tubes for the last 7 weeks of her life. So for the first time, I got to see Ellie’s whole face. Her chubby little cheeks, all puffed up from the sedation meds, were precious and perfect. 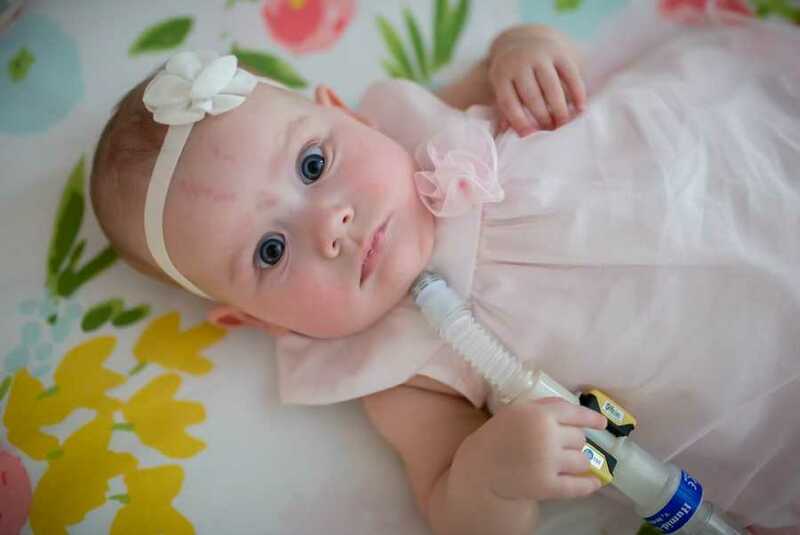 After the trach surgery, Ellie would have practically been ready to come home within a week or two, but the true journey for Kevin and myself was just beginning. We needed to become trach-trained and certified in order to bring our daughter home from the hospital. 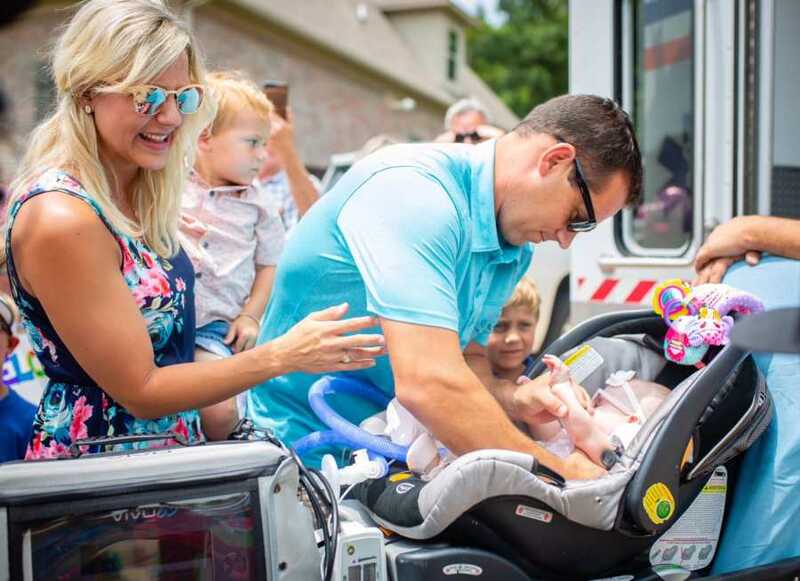 We would continue to spend many more months on the road back and forth to Children’s Hospital, splitting the time between life at home with the boys and life in the hospital with Ellie, learning all her needs and how to care for her. 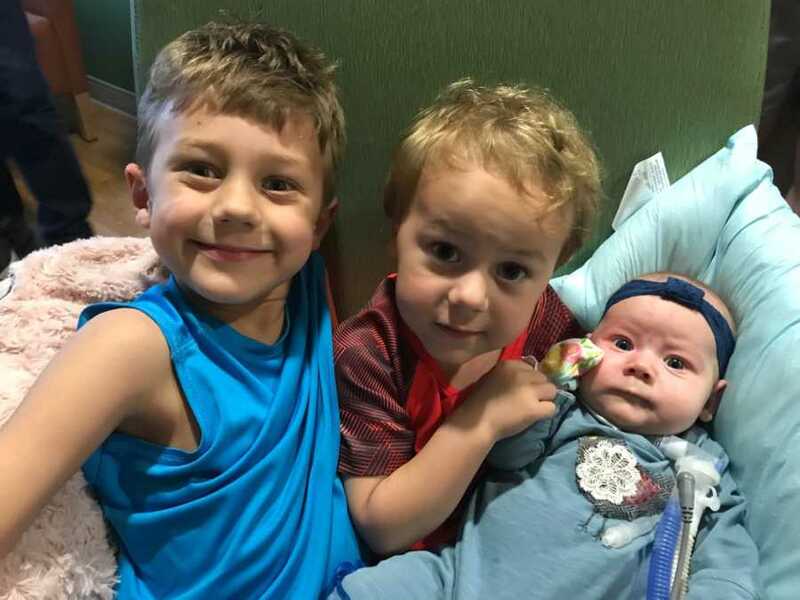 As time went on, our sons acclimated and did a marvelous job adjusting, and even Ellie began developing and reaching her milestones as if she weren’t even in the hospital. Thankfully Ellie’s cognitive and behavioral development has not been altered or affected. Plus, she gets off the ventilator several times a day now and breathes on her own while awake! We personally have met several young adults with CCHS who are currently living on their own and attending college, and others who have gone on to get married and have children. Most of them only use the ventilator while sleeping. While there are many discouraging aspects about CCHS and life will never be the same as we have known it, we are so thankful and grateful for how far our Ellie has already come. God has used this experience to change our family for the better, and we will never be the same after this trial. 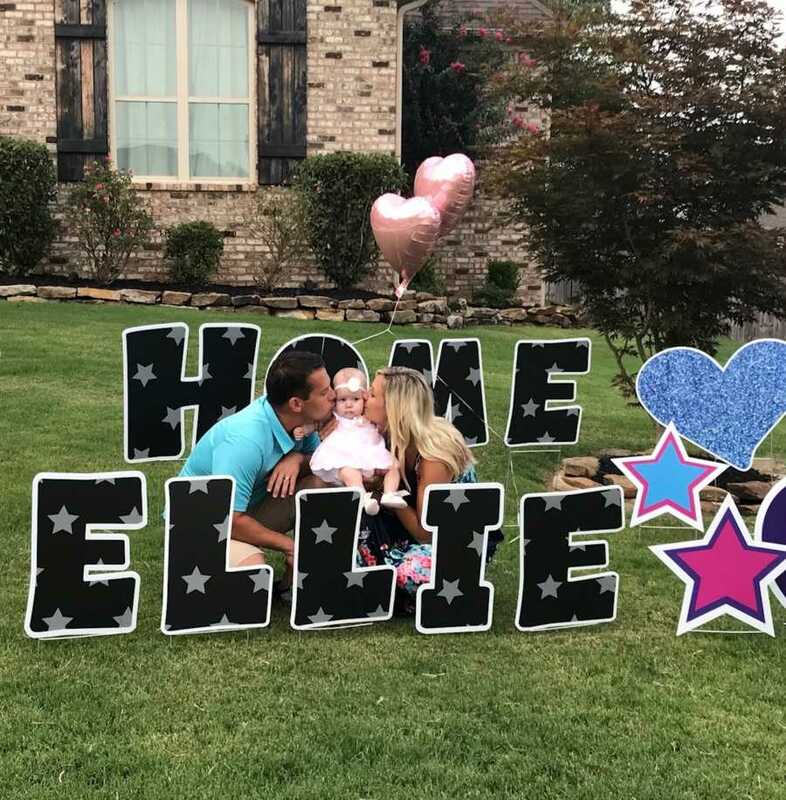 Throughout every trial are highs and lows, and I would say the highest high was the day Ellie finally came home from Arkansas Children’s Hospital. 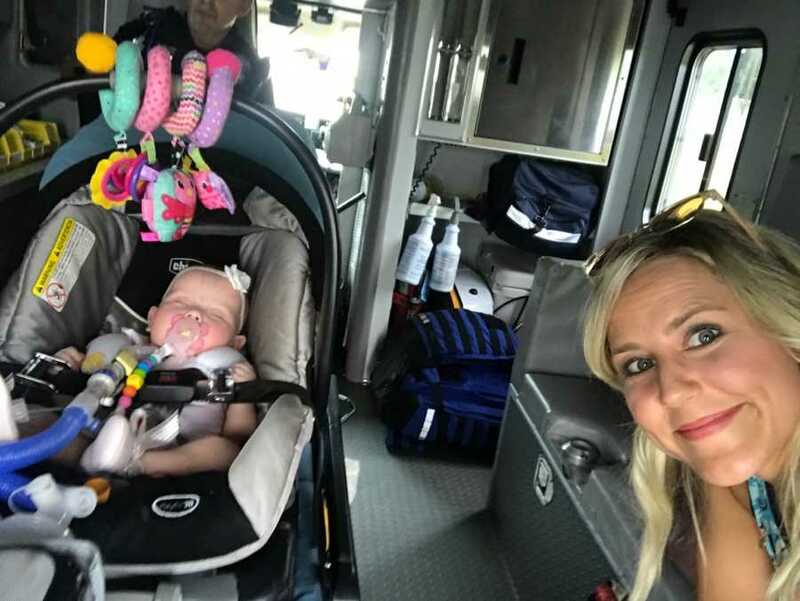 After 195 days, my very last trip home from the hospital was riding in the back of an ambulance with Ellie. Kevin and the boys were following behind us, and as we entered onto our street, the driver said, ‘Which house is it?’ Then he stopped mid-sentence to say, ‘Oh… oh never mind, you’ve got quite a crowd waiting.’ My family had surprised us and gathered tons of friends and neighbors to line the streets of our cul de sac with banners and posters and balloons, and they were loudly cheering. 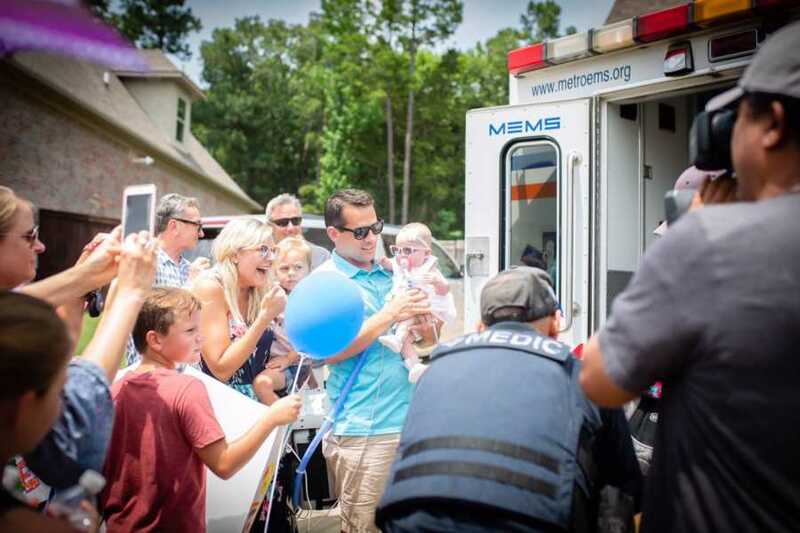 I looked out the ambulance window and started bawling as I saw the crowd so excitedly yelling for Ellie. As we drew closer, I couldn’t help but think about heaven and how I could taste a small glimpse of what it will be like entering into the streets of heaven one day. 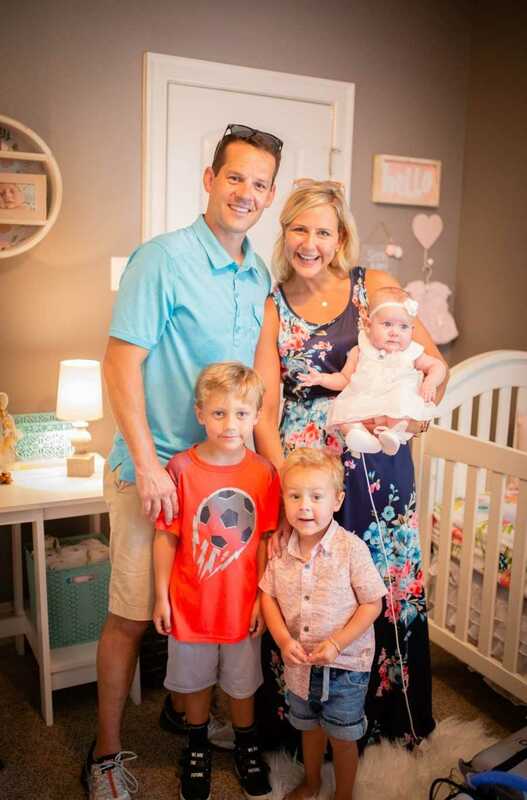 Ellie has had a whole world out there just waiting for her, yet the only life she knew for the past 6.5 months was within the four small walls of Room 23 in the Infant Toddler Unit at Children’s. 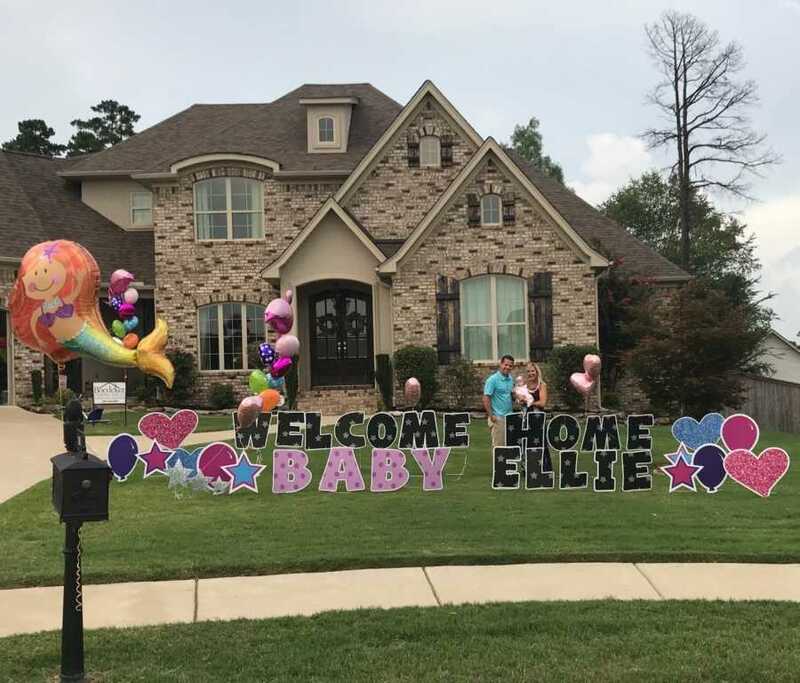 There are no words to describe how wonderful and amazing it was to welcome our daughter home after 195 days in the hospital. The only way we made it through those months was taking it one day at a time and sometimes one hour at a time. 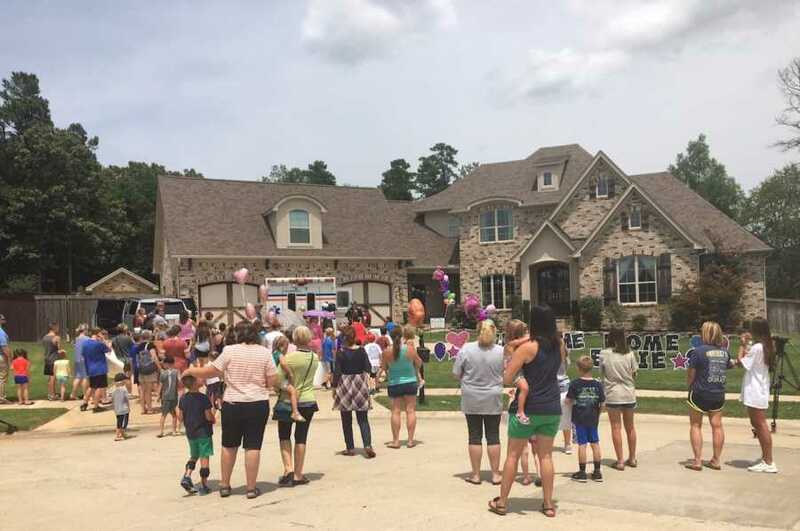 My husband and I had talked about inviting just 4 people over on the day of her homecoming, but little did we know what my family had been working on for such a huge surprise. As a mom, my heart was bursting with overwhelming feelings of love and excitement and every emotion possible. Seeing all 3 children and our family of 5 all together at our house for the very first time is something I had waited for for way longer than I ever expected, and nothing could describe how amazing that moment felt! This story was submitted to Love What Matters by Emily Boedeker of Central, Arkansas. Submit your own story here, and subscribe to our best stories in our free newsletter here.